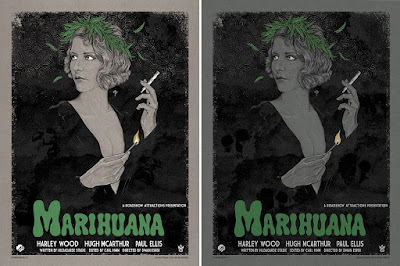 Timothy Pittides continues his fantastic Vices screen print series with “Marihuana”, a pretty appropriate release for 4/20 if you ask me! Produced by Grey Matter Art, this is the third and final poster in Pittides newest triptych, which also features “Opium” and “Cocaine”. This is the 10th screen print in the series, which is based on the propaganda films from the early 20th century. 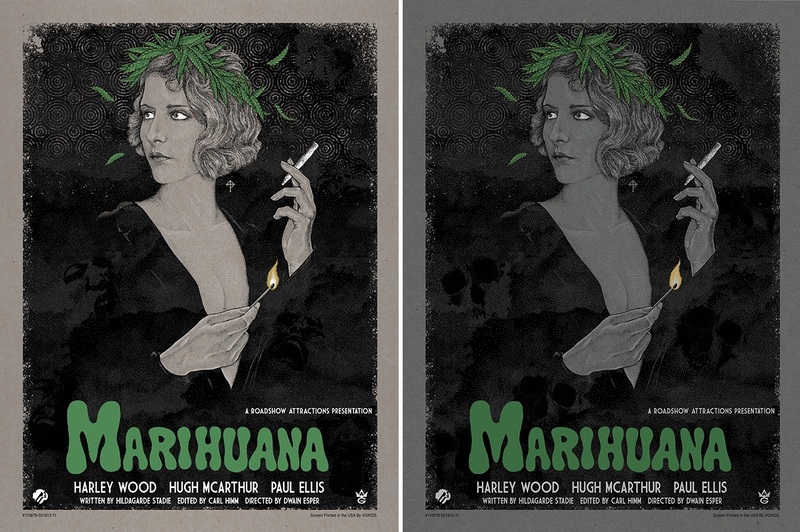 Marihuana by Timothy Pittides is an 18”x24” hand numbered 5 color screen print with metallic ink. The Regular Edition features metallic gold ink, is limited to 70 pieces and will retail for $35, while the Variant features metallic silver and gold inks, is limited to just 35 pieces and will retail for $45. Both versions go on sale at 1pm EST today, Thursday, April 20th, at the Grey Matter Art online store.